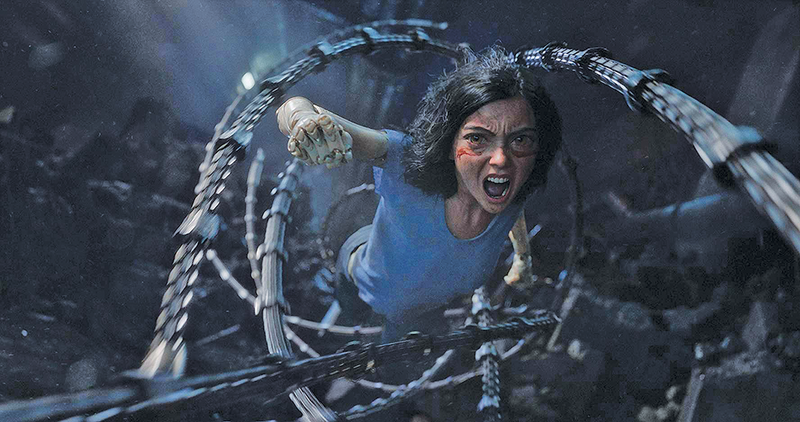 Alita: Battle Angel finds some heart in high-tech spectacle. How close are we to the post-spectacle cinematic era? It might seem like a counterintuitive question in 2019, as theatrical releases seem to focus more and more on blockbusters, while mid-budget stories flee to cable and streaming services in ever-growing numbers. But more than 25 years after Terminator 2 and Jurassic Park changed the game with revolutionary CGI technology, we get multiplex visits to dazzling fantastical universes almost monthly. From Wakanda to Atlantis, from distant planets to dystopian futures, it's easy for awe fatigue to set in. No matter how much work a creative team puts into special effects, something human is required for a story to grab audiences' attention. Somewhere between the oohs and the aahs, there has to be an emotional connection. In adapting the 1990s manga story Battle Angel Alita—also known in Japan as Gunnm—screenwriters James Cameron and Laeta Kalogridis and director Robert Rodriguez have a familiar kind of landscape as the foundation for their futuristic fantasy. In the year 2563, a metropolis called Iron City has emerged in the shadow of the last remaining floating city, a much-desired destination called Zalem. At the center of this surface city is a pile of garbage ejected from Zalem that would keep WALL-E busy for centuries—and it's there that scavenging scientist Dr. Dyson Ido (Christoph Waltz) finds the discarded head and core of a cybernetic human he calls Alita (Rosa Salazar), who awakens with a new body created for her by Ido and no memory of her previous life. Obviously a lot of the world-building work for Alita was done by the source material, but Rodriguez and Cameron do a reasonably effective job of establishing this setting's economy of gleaners, criminals and government-sponsored mercenaries. It even feels just right that civic life in Iron City revolves around watching and betting on a roller derby-esque game called motorball, with the game's primary mogul/fixer, Vector (Mahershala Ali), as the city's de facto boss. If you want to make a world believable, make sure the underclass gets its bread and circuses and make the faint hope of getting out dependent on success in a violent sport. More than the trappings of this world, though, Alita's wow factor depends on Iron City's various electronically enhanced denizens. There's not exactly anything game-changing in the design of characters like the human-faced, robot-bodied Zapan (Ed Skrein) or the massive assassin Grewishka (Jackie Earle Haley), with his ejectable hand-claws, but they occupy a universe where people with artificial body parts interact seamlessly with unenhanced humans. A dreary post-apocalyptic urban center might not get the blood flowing, but the inhabitants—and their furious battles, as staged by Rodriguez—are consistently interesting to look at. The surprising center, however, is Alita herself, and it's not just because of the stylized animation that renders her with oversized anime-style eyes. In a sense, there's a familiar arc to Alita as an amnesiac whose dangerous abilities show themselves in bits and pieces—she's a little bit Jason Bourne, a little bit Iron Giant—and there's certainly nothing radical about her infatuation with a kindly scavenger named Hugo (Keean Johnson). Yet Salazar invests the character with an infectious humanity, even when the scenarios are as predictable as a baby enjoying chocolate for the first time. It takes a special kind of performance to shine through not just when your face is digitally altered, but when the situations involve archetypal hero quests and cut-and-paste relationship dynamics. Sharing the screen with winners of a total of four Oscars—Jennifer Connelly as Ido's enigmatic ex-wife, is part of the supporting cast in addition to Waltz and Ali—Salazar radiates charisma and finds both power and decency in Alita. That's what a would-be blockbuster—and, it's clear from the final scenes, would-be franchise—needs in order to stand out from the pack in 2019, much more than an investment in hundreds of programmers to render your story's physical architecture. Sure, it's a well-crafted action movie, and it looks impressive in IMAX 3D. But when Alita: Battle Angel works, it's because there's some feeling in the middle of familiar genre material. Like Alita herself, it's less about all the cutting-edge technology than about the heart that drives it.